This attractive, spreading shrub is a native of northern New South Wales. The common name is Tingha Golden Wattle. Tingha is a village near Inverell on the Northern Tablelands of NSW. One of the strongholds, of Acacia leptoclada, is the Goonoowigall State Conservation Area. This large, bushland area protects a range of interesting native plants including A. leptoclada and is situated near Inverell. Acacia leptoclada reaches a height of three to four metres in the wild. We find that with light pruning, specimens attain a compact height of two metres. Bark is smooth, grey or greenish brown. The bipinnate foliage is fine and feathery with small leaflets. In mid spring plants become covered with large, globular, golden yellow flower heads. The common name is very apt. Acacia leptoclada would be an ideal shrub to slot into a native shrubbery. In spring its golden flowers will light up that part of the garden. 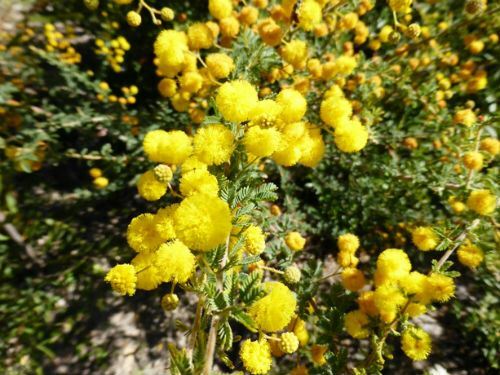 The Tingha Golden Wattle is found in the North West Slopes and Northern Tablelands of NSW. The species name means slender branches. We have been interested in propagating wattles from cuttings and have had some success with those with phyllodes. We tried cuttings of the bipinnate Acacia leptoclada and were very happy with the result. 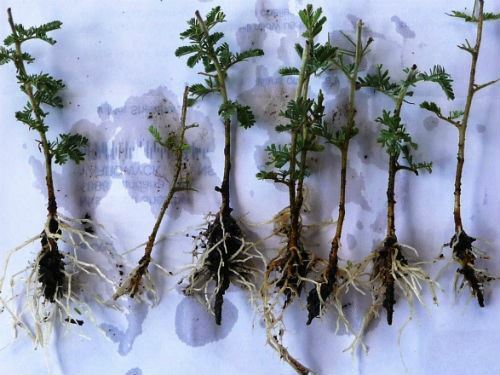 Cuttings produced roots rapidly and in large numbers (see thumbnail). Although our specimen blooms profusely no pods are produced after flowering. Because cuttings produce roots readily we have been able to produce more plants of this attractive and unusual wattle and spread them throughout the garden.